Go to original pattern for design DROPS 90-2. DROPS 6 mm [US 10] circular and double-pointed needles, or size needed to obtain correct gauge. 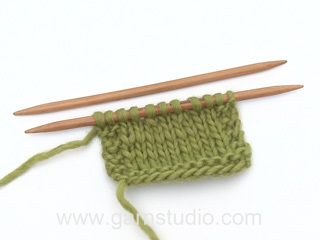 Gauge: 15 sts x 20 rows in stockinette st = 10 x 10 cm. Dec 1 st as follows in each transition between sleeve, front and back (start 2 sts before the marker): K 2 tog, marker, slip 1 st as if to knit, K 1, psso. 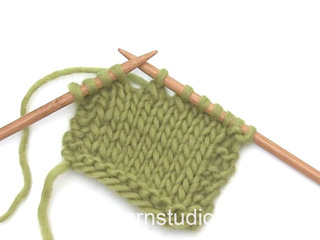 Knitting tip: If your row gauge is too tight, the armhole and raglan will be too short. 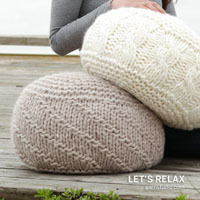 Adjust for this by knitting an extra row as needed without decs. Body: Cast on 96-102-114-126-132 sts with Symphony; join and place a marker at the join. K 1 row, then P 1 row. Then knit stockinette st. Put a marker at the other side (48-51-57-63-66 sts between markers). When the piece measures 7 cm inc 1 st at each side of each marker every 7 cm a total of 3 times = 108-114-126-138-144 sts. When the piece measures 23-25-27-28-29 cm cast off 6-6-6-6-8 sts at each side for armhole (that is, 3-3-3-3-4 sts at each side of each marker) = 48-51-57-63-64 sts remain on front and back. Lay piece aside and knit the sleeve. 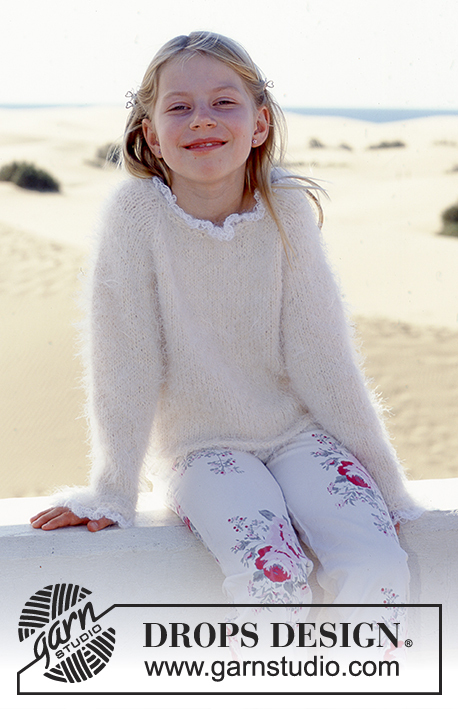 Long sleeve: Loosely cast on 36-38-40-40-42 sts on double-pointed needles; join and place a marker at the join. K 1 row, P 1 row. Then knit stockinette st. When the piece measures 3 and 6 cm dec 4 sts evenly distributed on the row = 28-30-32-32-34 sts. When the piece measures 10 cm inc 1 st each side of marker every 8-6.5-7.5-6.5-6 cm a total of 4-5-5-6-7 times = 36-40-42-44-48 sts. 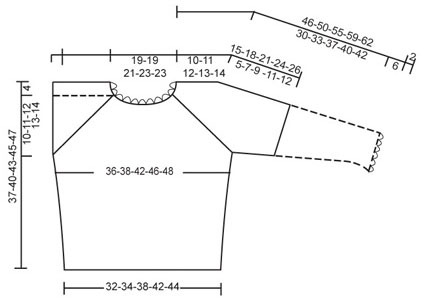 When sleeve measures 36-39-43-46-48 cm dec 3-3-3-3-4 sts each side of marker = 30-34-36-38-40 sts. Lay piece aside and knit second 1 sleeve. 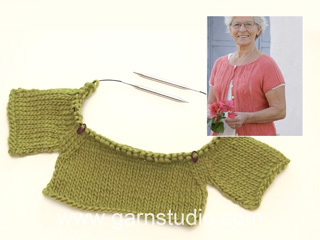 Short sleeve: Loosely cast on 32-34-34-36-40 sts on double-pointed needles; join and place a marker at the join. K 1 row, P 1 row. Then knit stockinette st, increasing 1 st each side of marker on the 1st row after purl row. Continue to inc 1 st each side of marker every 2-2-2-2.5-3 cm a total of 1-2-3-3-3 times = 36-40-42-44-48 sts. When sleeve measures 5-7-9-11-12 cm bind off 3-3-3-3-4 sts each side of marker = 30-34-36-38-40 sts. Lay piece aside and knit second sleeve. 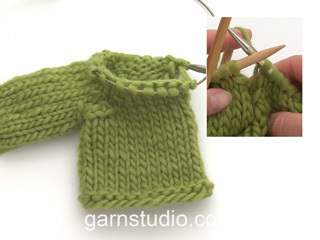 Yoke: Put the sleeves in on the same circular needles as Body where you bound off for armholes= 156-170-186-202-208 sts. Put 1 marker in each transition between Body and sleeves (= 4 markers). Knit 3-1-1-1-1 rows before beginning shaping. Read the entire pattern before knitting further. Raglan shaping: Dec 1 st at each side of each marker (= 8 decs per row). Dec every other row -- see knitting tips above: 9-11-12-13-14 times. Neck: At the same time when the piece measures 33-36-39-40-42 cm put the center 16-17-17-17-18 sts on a st holder for the neck. Bind off at each neck edge every other row: 2 sts 2-2-2-1-1 time and 1 st 0-0-0-3-3 times. After all raglan and neck shaping is complete 60-57-65-71-68 sts remain on needles. Neckband: Pick up 22-30 sts on front neckline (incl. sts on st holder) with Symphony = approx. 79-101 sts. K 1 row (right side row), decreasing evenly distributed on the row to 49-54-54-58-61 sts. K 1 row, P 1 row, and bind off loosely. Neck frill: Pick up approx. 49-54-54-58-61 sts from right side of bound-off edge of neck on double-pointed needles with Vivaldi; join and K 1 row (right side row). On the next row, * K 1, yo * around the entire row. On the next row, twist and K each yo from previous row = approx. 98-108-108-116-122 sts. 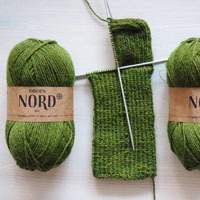 Bind off all sts – but so that the bound-off edge will not be too tight, make and bind off a yo after every st.
Frill on lower edge of long sleeve: Pick up approx. 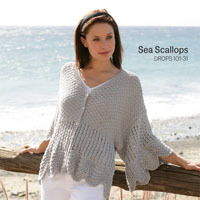 36-38-40-40-42 sts in cast-on edge of sleeves and knit frill in the same manner as neck. Le nombre total de mailles diminuées et le nombre total de mailles restant après les diminutions n'est pas juste : 4 mailles de chaque côté = 16 mailles --> 144 -16 = 128 ; 128 ; 2 = 64. Les mailles restantes que vous écrivez (48-51-57-63-66 et non 63) représentent 12 mailles et non les 16 théoriques. Bonjour Kathylou, effectivement, il y avait une faute de frappe dans la dernière taille, on doit bien avoir 64 m et non 63. Merci, bon tricot! Second paragraph of the body instructions says to decrease 6 stitches should this a bind off stitches instead of decrease? Dear Diane, you are correct, you cast off 6 sts each side for armhole. Happy knitting!